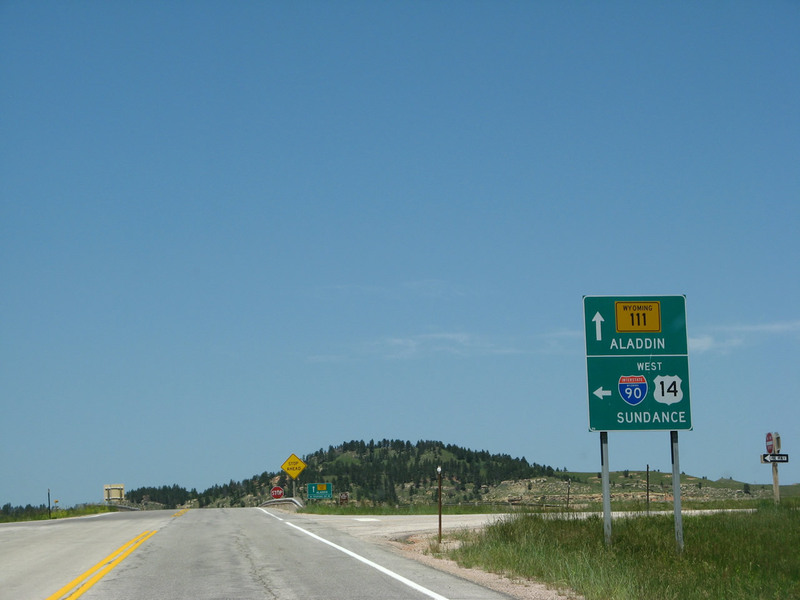 Wyoming 111 is a secondary state route originating at Interstate 90 and U.S. 14 Exit 199 and traveling north to Wyoming 24 (Milepost 39.66) near Aladdin. Mileposts increase from north to south. 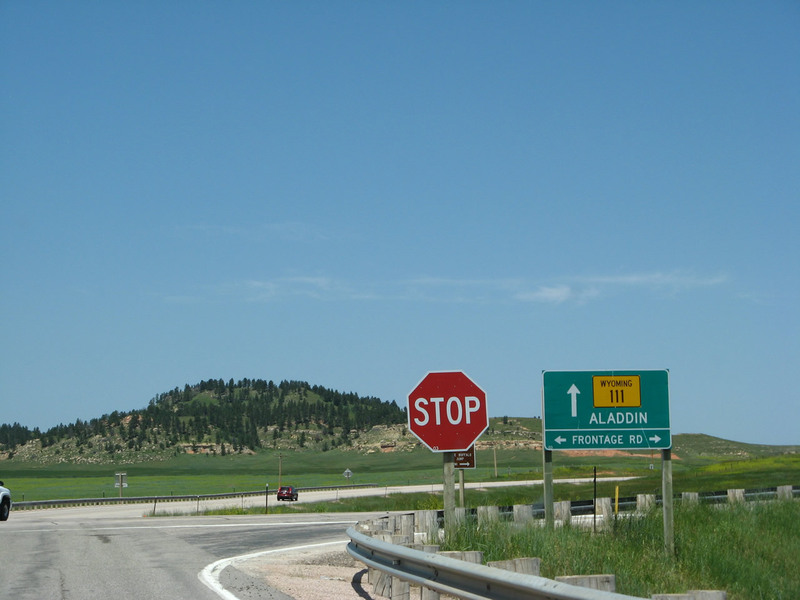 Milepost 0.00 is the junction with Wyoming 24, and Milepost 8.63 is the junction with Interstate 90 at the Aladdin Interchange. After passing under Interstate 90, Wyoming 111 begins its northbound journey toward Aladdin. 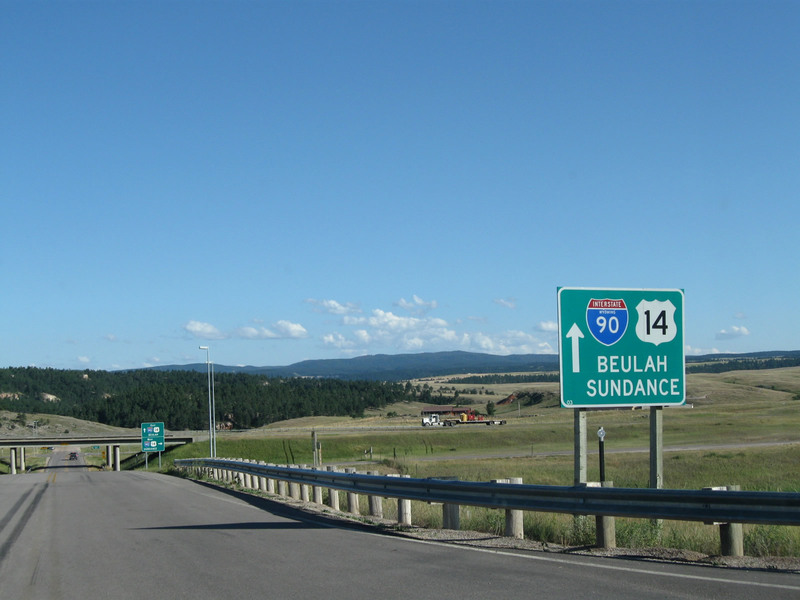 Here, a left turn connects Wyoming 111 to Interstate 90 and U.S. 14 west to Sundance, Moorcroft, and Gillette. Ahead, the next intersection is with Old U.S. 14 (I-90 Frontage Road). Photo taken 07/05/08. 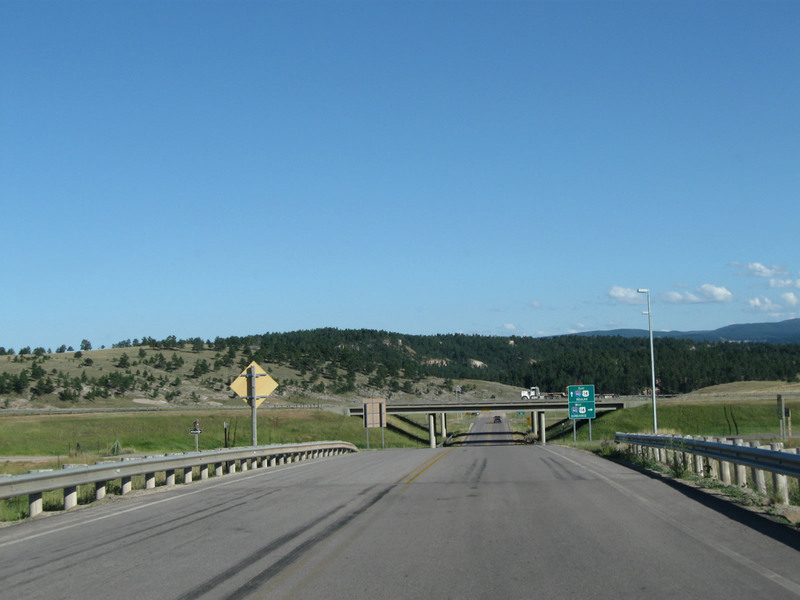 Northbound Wyoming 111 meets Old U.S. 14 (I-90 Frontage Road). 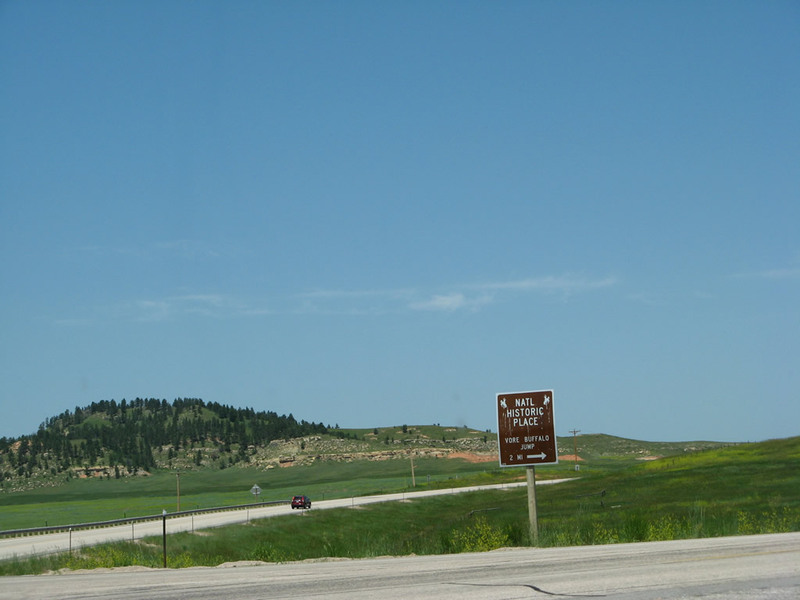 Turn right here for Old U.S. 14 east to the Northeast Wyoming Information Center and Vore Buffalo Jump. Continue straight ahead for Wyoming 111 north to Aladdin and Wyomingi 24. Turn left for Old U.S. 14 west to Sundance. Photo taken 07/05/08. 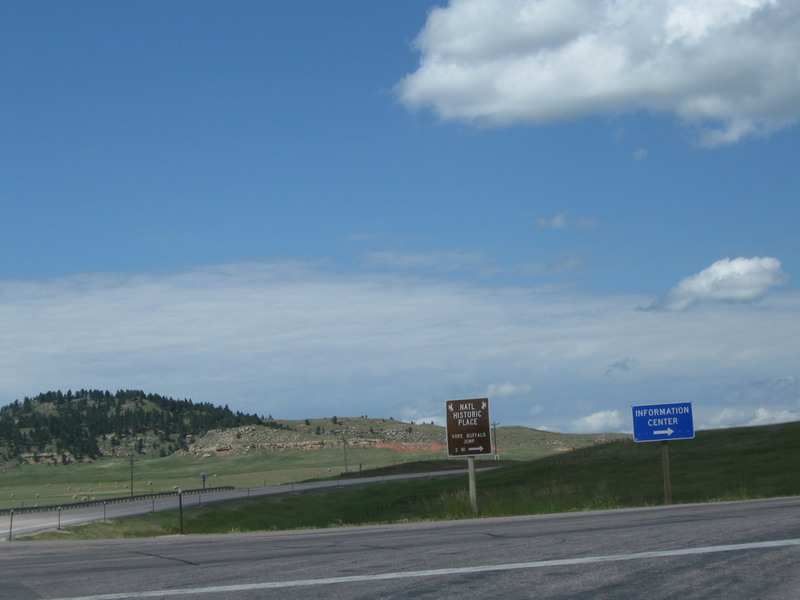 Turn right (east) on Old U.S. 14 (I-90 Frontage Road) to the Vore Buffalo Jump and the Northeast Wyoming Information Center (note the change in signs between 2008 and 2010). The Vore Buffalo Jump is a major archaeological site located between Old U.S. 14 and Interstate 90 on the north side of the freeway. Discovered when the Interstate 90 freeway was being constructed in the early 1970s, the Vore Buffalo Jump is "a natural sinkhole that was used as a bison trap from about 1500 to 1800 A.D. Buffalo were driven over the edge of the sink hole as a method for the Native American tribes to procure the large quantities of meat and hides needed to survive the harsh prairie winters." Students and scholars frequent the site to excavate old bones and continue to find the remains of animals. A visitors center and excavation site building (opened in July 2011) are available on site for visitors for a nominal fee. Photos taken 07/05/08 and 08/13/10. Now traveling southbound after the intersection with Old U.S. 14 (I-90 Frontage Road), southbound Wyoming 111 next approaches the interchange with Interstate 90 and U.S. 14 south of Aladdin and west of Beulah. The next right connects to Interstate 90 and U.S. 14 west to Sundance and Gillette. Photo taken 08/16/11. This is a centerline view of Wyoming 111 south between Old U.S. 14 (I-90 Frontage Road) and Interstate 90 and U.S. 14. Photo taken 08/16/11. Southbound Wyoming 111 meets the onramp to Interstate 90 and U.S. 14 west to Sundance and Gillette. 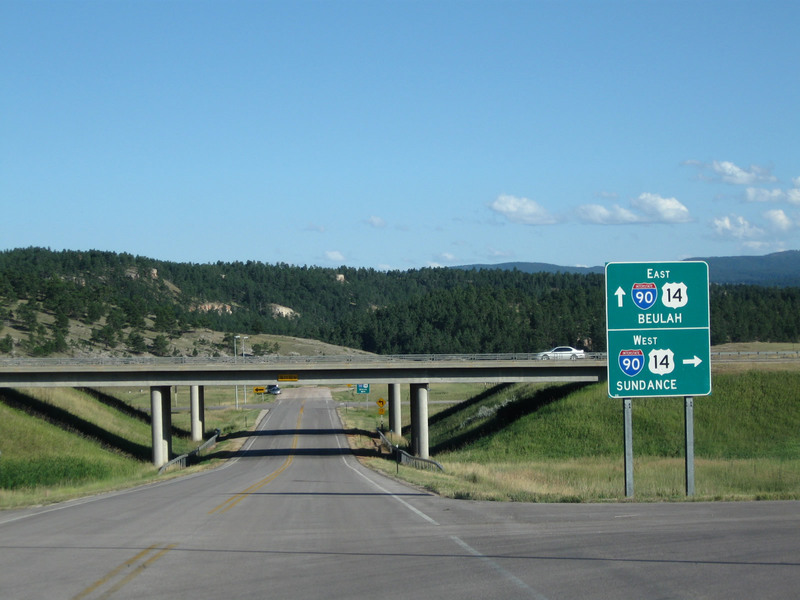 Continue under the bridge to connect to Interstate 90 and U.S. 14 east to Spearfish, Sturgis, and Rapid City. Photo taken 08/16/11. Page Updated August 28, 2011.